By passing the bill, lawmakers carried out the threat that Lt. Gov. Casey Cagle, R, made to Atlanta-based Delta earlier this week: if the airline did not restore discounted fares to members of the National Rifle Association, Republicans would strike down a $50 million sales-tax exemption on jet fuel from its larger tax-cut package. Delta, which is one of the state’s largest employers, would have been the primary beneficiary of the exemption. Cagle threatened Delta days after it announced it would stop offering discounted fares to NRA members amid the national gun-control debate after the deadly Valentine’s Day shooting at Marjory Stoneman Douglas High School in Parkland, Florida. United Airlines, Best Western, MetLife and at least a dozen other companies also cut perks and discounts to NRA members. The bill granting the jet-fuel tax exemption was easily approved in the House last week, and appeared to have wide support. Advocates said it would attract flights to Atlanta as opposed to other major airports, where jet-fuel taxes are charged. But in the days since Delta’s announcement, other Georgia Republicans rallied behind Cagle, and the Senate Rules Committee on Wednesday voted to remove the jet-fuel exemption from the tax-cut package. Cagle, who has served as Georgia’s lieutenant governor since 2007, could weave the issue into his campaign in Georgia’s upcoming gubernatorial race, in which he is considered the leading GOP contender to replace Gov. Nathan Deal, R. Deal this week said he would reluctantly support the measure because of the bill’s broader cuts to the state’s income tax rate, according to the Atlanta Journal-Constitution. Delta has not commented on the threat from Cagle, who says he is “a lifelong member of the NRA” and boasts that he has earned an A+ rating from the organization every year he has served in elected office. The airline could not immediately be reached for comment on lawmakers’ removal of the tax exemption. Delta at first resisted taking a stance, as companies with even the slightest affiliation to the NRA were called out and a list of companies that had cut ties with the NRA began circulating on Twitter. But Delta held out against the pressure for only a few hours. In the days since the showdown between Delta and Georgia Republicans began, top blue-state politicians have encouraged Delta to relocate its hub from Atlanta. “@Delta, if Georgia politicians disagree with your stand against gun violence, we invite you to move your headquarters to New York,” said New York Gov. Andrew Cuomo, D, in a tweet Tuesday. Torshin is a prolific Twitter user, logging nearly 150,000 tweets, mostly in Russian, since his account was created in 2011. Previously obscured by language and by sheer volume of tweets, Torshin has written numerous times about his connections with the NRA, of which he’s a known paid lifetime member. NPR has translated a selection of those posts that document Torshin’s relationship to the group. Torshin is a former Russian senator and served as the deputy speaker of Russia’s parliament for more than a decade. Known as a Putin ally, he also spent time on Russia’s National Anti-Terrorism Committee, a state body that includes the director of Russia’s internal security service and the ministers of defense, interior and foreign affairs. Torshin’s use of NRA connections to open doors, and his 2015 claim to know Trump through the organization, raise new questions about the group’s connections with Russian officials — at a time when the organization is being roundly criticized by its opponents, and at times the president himself, for opposition to gun control. The NRA has been a key part of Trump’s conservative base. After a meeting with lawmakers in which Trump angered many conservatives for entertaining proposals for gun control, the president tweeted that he had another meeting with NRA leaders in the Oval Office on Thursday night. On his verified Twitter account, Torshin talked about how he knew Donald Trump through the NRA, citing a connection at the group’s 2015 convention. Responding to a tweet about comedian Larry David accusing Trump of being a racist, Torshin said he knew the businessman through the NRA, and defended him. “I saw him in Nashville” in April 2015, Torshin added later, the date and site of the NRA’s 2015 convention. Trump gave a speech at that convention, the outlines of which would become familiar as his stump speech throughout the 2016 presidential campaign. The White House did not respond to repeated requests for comment by NPR, but denied Trump has ever met Torshin to Bloomberg News in 2017. Torshin’s attendance at the NRA convention in 2016 is where he reportedly met with Donald Trump, Jr.
Torshin had made repeated attempts to meet with Donald Trump himself at that convention during the presidential election year, but there is no evidence of this occurring. A conservative activist with ties to Torshin aide Maria Butina reached out to the Trump campaign in 2016, saying that Russia was “quietly but actively seeking a dialogue with the U.S.” and would try to use the NRA convention to make “first contact,” the New York Times reported. “Putin is deadly serious about building a good relationship with Mr. Trump,” the activist, Paul Erickson wrote. “He wants to extend an invitation to Mr. Trump to visit him in the Kremlin before the election.” Erickson has business ties to Butina, having started an LLC with her in South Dakota. On Twitter, Torshin portrayed these meetings as more than merely casual encounters. In 2017, he tweeted that he was bringing a gift to then-NRA President Allan Cors, and suggested he was familiar with Cors’ hobbies. In a public DropBox album that Torshin linked to from his Twitter account, he’s seen meeting with former NRA president Jim Porter, as well as former NRA president David Keene. Repeal The Second Amendment? That’s Not So Simple. Here’s What It Would Take. Torshin has also met the current president of the NRA, Pete Brownell. Brownell was part of an NRA delegation that visited Moscow in 2015. These relationships that he cultivated appeared to open another door. Torshin came to the United States in 2012 as an international election observer, and watched as ballots were cast during the Obama-Romney presidential contest in Tennessee. This was possible, he wrote, due to his NRA links. “Tennessee resident Kline Preston requested Mr. Torshin to be an international observer in November 2012,” Adam Ghassemi, a spokesman for the Tennessee Secretary of State, told NPR. The Washington Post reported last year that Preston, a Tennessee lawyer, was the one who originally introduced Torshin to former NRA president David Keene back in 2011. The Russia Investigations: Is ‘Infiltration’ The New ‘Collusion’? Wyden, the top Democrat on the Senate Finance Committee and a member of the Senate intelligence committee, has demanded the Treasury Department’s Financial Crimes Enforcement Network hand over documents related to Torshin and the NRA. Rep. Adam Schiff, the top Democrat on the House intelligence committee, told NPR this week that the committee’s members have asked relevant witnesses about the NRA through the course of their investigation. Not only are congressional investigators interested in the NRA’s relationship with Russia, but this inquiry comes as the NRA is receiving additional pressure from groups hoping to pass additional gun restrictions into law, and as dozens of American companies have cut ties with the NRA in the wake of the Parkland, Fla., shooting last month. NPR’s Alina Selyukh and Audrey McNamara contributed to this story. 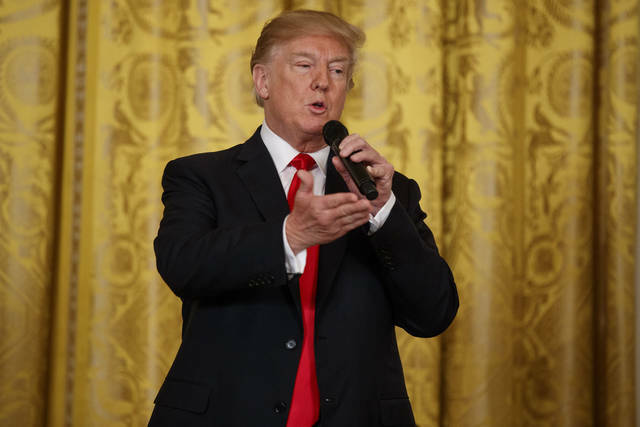 President Donald Trump on Thursday suggested using the death penalty on drug dealers to address the opioid epidemic, equating providing lethal drugs with murder. Trump said countries that impose the death penalty on drug dealers have a better record than the United States in combating substance abuse. “Some countries have a very, very tough penalty — the ultimate penalty — and by the way, they have much less of a drug problem than we do,” he said. 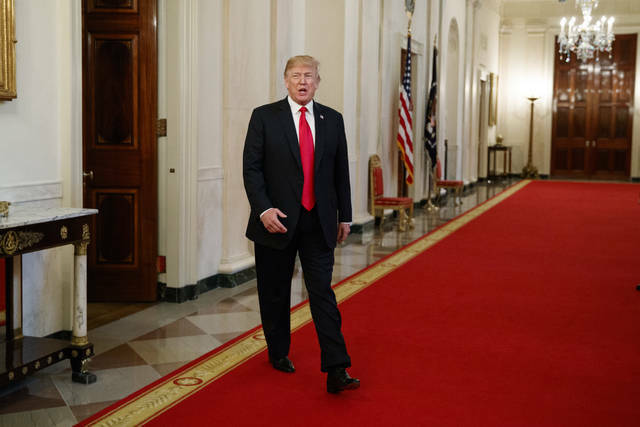 The remarks follow media reports earlier this week that Trump has privately praised countries like Singapore that mandate the death penalty for drug traffickers, arguing a softer approach to substance abuse won’t be successful. The remarks are likely to rankle administration critics who have urged the White House to focus on the public health component of the opioid crisis. The president’s remarks did not touch on health approaches like providing additional funding for treatment. He and others said the government would be better offer treating people for addiction than imprisoning them. It’s also unclear whether harsh sentences for drug dealers lower the level of drug use in a country. While Singapore “has done a pretty good job of reducing drug consumption,” countries like the Philippines, Thailand and Malaysia still have “‘huge” drug problems, Kleiman said. “There is a certain easiness about talking tough when in fact we have been talking tough for years and it hasn’t gotten us anywhere,” Kennedy said. Former Republican Rep. Mary Bono, co-founder of the Collaborative for Effective Prescription Opioid Policies, said Trump should have specified who he was referring to when suggesting harsh penalties for drug dealers. Trump’s remarks also deviate from the tone taken by his own Surgeon General Jerome Adams earlier Thursday. At a U.S. Chamber of Commerce event on the opioid crisis, Adams talked about his brother, who is in state prison due to crimes he committed to support his addiction. He emphasized the need for the country to move toward earlier intervention and strengthening its mental health services so that drug-related crimes and prison can be avoided. “At the end of the day, if you commit a crime, there are folks out there who are dedicated to and need to address the public safety aspect of it, but the question I ask myself is how many opportunities did we miss earlier on to have had that warm handoff, to have connected him to care so that he didn’t continue to go down his addiction pathway, his criminal pathway. That would have saved us money and save trouble for the people who he honestly did victimize,” Adams said. He expressed support for going after pharmaceutical companies and distributors that supply prescription painkillers for their role in the crisis. Attorney General Jeff Sessions said this week that the Justice Department will file a statement of interest in litigation that includes hundreds of lawsuits by states and localities against opioid manufacturers and distributors. The Justice Department will argue that the federal government has borne substantial costs due to the opioid epidemic and should be reimbursed for health programs and law enforcement efforts to combat the crisis. Cities, counties and states are seeking to recover the costs associated with providing treatment and public safety, by targeting companies that they allege used false, deceptive or unfair marketing practices for prescription opioids. Sessions also said the federal government is studying the possibility of initiating its own opioid litigation. The federal government previously went after many opioid-makers in court a decade ago, with companies like Purdue Pharma pleading guilty to misleading regulators, doctors and patients about the drugs’ risks of addiction and abuse. Trump’s remarks came at the end of a summit that highlighted different approaches to addressing drug abuse. HHS Secretary Alex Azar talked about increasing access to treatment programs and focusing on researching non-opioid pain therapies. HUD Secretary Ben Carson discussed how communities can provide support and housing for people suffering from addiction. Some public health experts advocated for a greater focus on prevention efforts. “My concern is we’re focused on treatment and arresting and not focused on prevention,” said Mike Fraser, the executive director for the Association of State and Territorial Health Officials. Advocates and drug policy experts said they are eager to see a follow-through.